To complete my toe up sock I decided I would stick to the theme of trying new techniques and end with an untried bind off. I flipped through my sock knitting book and decided on the Double Knit Twisted Bind Off, which was described as both ‘very stretchy’ and ‘reinforced’. Sounds ideal, I thought, especially since I am notorious for binding off too tight. Basically, you knit two stitches, then slip them back onto the left needle and knit them together through the back loop. Knit the next stitch, slip back onto the left needle, knit together through the back loop. Etc. It’s straightforward and easy, which I like. 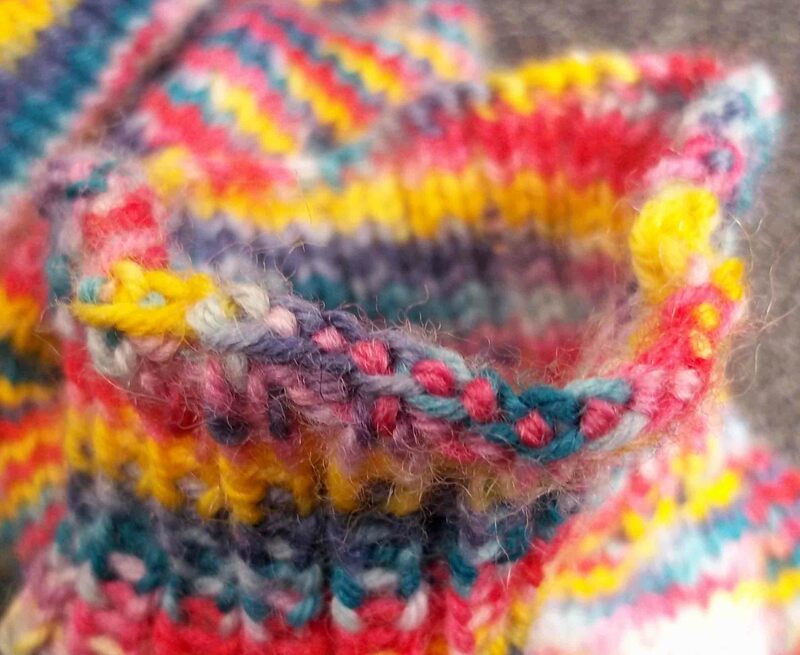 What I also like about it, which was probably emphasized by the multicolored yarn I knit with, is the decorative little bumps you get across the bound of edge. The edge does curl out some from the ribbing in its relaxed state, but since the point of socks is to wear them it doesn’t matter to me. Unfortunately, it is still possible to bind off too tight, so my first attempt had to be tinked. But, the second attempt was a sock-cess! Oh, that was so bad of me. Sometimes I just can’t help myself! What bind off do you prefer for toe up socks?